THE ULTIMATE FIGHTING CHAMPIONSHIP® PROUDLY PRESENTS THE REMAINING BOUTS FOR UFC® 128 IN NEWARK, N.J.
Las Vegas, NV (USA) – The Ultimate Fighting Championship® is pleased to announce the remaining bouts for its return trip to Prudential Center in Newark, N.J. on March 19. The UFC® again brings a star-studded lineup to New Jersey featuring must-see matchups in every division. 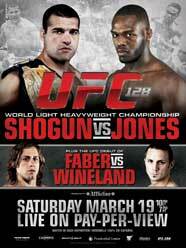 Having already announced the blockbuster headliner of Mauricio “Shogun” Rua defending his UFC light heavyweight championship against Jon “Bones” Jones and a co-main event featuring Urijah “The California Kid” Faber taking on Eddie Wineland in a battle at bantamweight, the UFC® confirms 10 additional bouts for UFC® 128: SHOGUN vs. JONES. The remaining bouts include: Jim Miller vs. Kamal Shalorus, Yoshihiro Akiyama vs. Nate Marquardt, Mirko Cro Cop vs. Brendan Schaub, Luiz Cane vs. Eliot Marshall, Edson Barboza vs. Anthony Njokuani, Ricardo Almeida vs. Mike Pyle, Kurt Pellegrino vs. Gleison Tibau, Joseph Benavidez vs. Ian Loveland, Raphael Assuncao vs. Erik Koch and Dan Miller vs. Nick Catone. Tickets for UFC® 128: SHOGUN vs. JONES are on sale now and priced at $500, $350, $225, $150, $100 and $60, not including applicable service charges. Tickets can be purchased at all Ticketmaster locations and at the Prudential Center box office. Ticket sales are limited to eight (8) per person. To charge by phone with a major credit card, call Ticketmaster at (800) 745-3000. Tickets also are available for purchase at www.prucenter.com or ticketmaster.com. UFC® 128: SHOGUN vs. JONES, which is presented by Affliction, will be available live on Pay-Per-View at 10 p.m. ET/7 p.m. PT on iN DEMAND, DirecTV, DISH Network, Avail-TVN, BellTV, Shaw Communications, Sasktel, and Viewer’s Choice Canada for a suggested retail price of $44.99 US/$49.99 CAN for Standard Definition and $54.99 US/$59.99 CAN for High Definition. The Cane vs. Marshall and Barboza vs. Njokuani bouts will air live on Spike TV at 9 p.m. ET/6 p.m. PT. Two additional bouts – Almeida vs. Pyle and Pellegrino vs. Tibau – will air on http://www.facebook.com/ufc at 8 p.m. ET/5 p.m. PT. Having won six straight and eight of nine fights in his UFC career, lightweight Jim Miller (fighting out of Whippany, N.J. / 19-2) looks to continue his rise to the top of the division. Once a collegiate wrestler at Virginia Tech, the New Jersey native also holds a black belt in Brazilian Jiu-Jitsu, and is coming off of a Submission of the Night victory over Charles Oliveira at UFC 124. Miller will surely have home field advantage in his fight against unbeaten four-fight WEC veteran Kamal Shalorus (fighting out of Austin, Texas / 7-0-2). A freestyle wrestler originally from Iran, the “Prince of Persia” is hoping to continue his winning ways and make a statement in his UFC debut in New Jersey. In an exciting battle at middleweight, top Japanese star Yoshihiro Akiyama (fighting out of Osaka, Japan / 13-3, 2NC) is back in action for the first time since losing a close decision to Michael Bisping at UFC 120. A Judo ace, Akiyama has strung together three-straight Fight of the Night performances starting with his debut at UFC 100, and is hoping to get back on the winning path when he takes on Nate Marquardt (fighting out of Denver, Colo. / 33-10-2). Nate “The Great,” a former challenger to the middleweight title, looks to put his Brazilian Jiu-Jitsu black belt and heavy hands to good use in his first bout since UFC 122 in Germany. Fan favorite Mirko Cro Cop (fighting out of Zagreb, Croatia / 27-8-2, 1NC) is back in action and looking to put his powerful legs to work. The former kickboxing and PRIDE® Grand Prix champion has seen his share of success overseas as well as in the UFC. With wins in three of his last five inside the Octagon®, the Croatian will continue his quest toward the heavyweight championship against Brendan Schaub (fighting out of Denver, Colo. / 8-1). “The Hybrid” is coming off of a unanimous decision victory over Gabriel Gonzaga at UFC 121 and is hungry for more. A winner of three straight overall, the former University of Colorado football player is planning on using his knockout power to secure another UFC victory. Brazilian Jiu-Jitsu black belt Luiz Cane (fighting out of Sao Paulo, Brazil / 11-3, 1NC) has used his aggressive style of fighting to find success inside the Octagon, including a Knockout of the Night performance in just his second UFC fight. “Banha” is fighting for the first time since UFC 114 in May, and is hoping that he can get back in the winner’s circle. He’ll take on Brazilian Jiu-Jitsu black belt and former The Ultimate Fighter® season eight cast member Eliot Marshall (fighting out of Boulder, Colo. / 11-3). Returning to the UFC for the first time in nearly a year, “The Fire” is hoping to make the best of it by claiming a win in his home state. Edson Barboza (fighting out of Jupiter, Fla. by way of Nova Friburgo, Brazil / 7-0) is looking to continue the dominance he displayed in his UFC debut at UFC 123 in November against Mike Lullo. The Brazilian nicknamed “Junior” impressed all with his vicious leg kicks that caused the TKO stoppage in round three. The 24-year-old Muay Thai ace will take on former WEC lightweight standout Anthony Njokuani (fighting out of Las Vegas, Nev. / 14-4). Originally from Nigeria, “The Assassin” has much to show for his seven fights in the WEC, including three Knockout of the Night performances. Having defeated Edward Faaloloto at WEC: Faber vs. Mizugaki in November, Njokuani is looking to continue the momentum in his UFC debut in the Garden State. A veteran of 10 UFC fights, with the first one being at UFC 31, Ricardo Almeida (fighting out of Hamilton, N.J. / 13-4) knows what it takes to be successful inside the Octagon. Coming off a unanimous decision victory over TJ Grant at UFC 124, “Big Dog” is ready to display his third degree Brazilian Jiu-Jitsu black belt skills in a tough welterweight battle. Standing in his way is Brazilian Jiu-Jitsu brown belt and Xtreme Couture product Mike Pyle (fighting out of Las Vegas, Nev. / 20-7-1). Having scored the upset decision victory over John Hathaway at UFC 120, “Quicksand” is looking to make it three in a row in Newark. New Jersey native Kurt Pellegrino (fighting out of Point Pleasant, N.J. / 21-5) is known for his slick submission game. Having won both Submission and Fight of the Night awards in past bouts, the fighter nicknamed “Batman” expect fireworks when he takes on the explosive Gleison Tibau (fighting out of Coconut Creek, Fla. / 31-7) in an exciting lightweight battle. A Brazilian Jiu-Jitsu black belt who trains with American Top Team, Tibau looks to continue his string of crowd-pleasing performances March 19. A seven-fight WEC veteran who trains with co-headliner Urijah Faber at Team Alpha Male, Joseph Benavidez (fighting out of Sacramento, Calif. / 13-2) makes his UFC debut in Newark. Benavidez already made a statement in the WEC’s bantamweight division by winning both Fight and Submission of the Night, as well as fighting for the WEC bantamweight championship. He hopes to impress UFC fans when he takes on Ian Loveland (fighting out of Portand, Ore. / 14-7). “The Barn Owl” is coming off of a dominating debut victory over Tyler Toner at The Ultimate Fighter® Finale in December, and is looking to use his Tae Kwon Do to garner another win inside the Octagon. Last winning a unanimous decision over LC Davis in November, five-fight WEC veteran Raphael Assuncao (fighting out of Atlanta, Ga. / 15-3) is hoping for the same victorious result in his UFC debut. He’ll put his Brazilian Jiu-Jitsu skills to the test when he faces Erik Koch (fighting out of Milwaukee, Wis. / 11-1), who makes his long-awaited UFC debut at the Prudential Center on March 19. The featherweight is riding a two-fight win streak that includes a Knockout of the Night performance in November. Now, the 22-year-old Iowan nicknamed “New Breed” is hoping to continue his dominance in the UFC 145-pound class. Middleweight Dan Miller (fighting out of Whippany, N.J. / 13-4, 1NC) is currently riding a two-fight win streak, most recently earning a split decision victory over Joe Doerksen at UFC 124. Like his brother Jim, Dan is a Brazilian Jiu-Jitsu black belt and has made great use of it in the past. Former NCAA Division I wrestler Nick Catone (fighting out of Brick, N.J. / 8-2) is standing in Miller’s way in this all-Jersey showdown. Having recently beaten Jesse Forbes, “The Jersey Devil” looks to start UFC 128 off with a bang by defeating his opponent in style.